Get ready to unleash your purging instincts with Rick and Morty as you fight to survive the annual purge festival on an alien planet. Play your cards right, and you'll make it out alive! 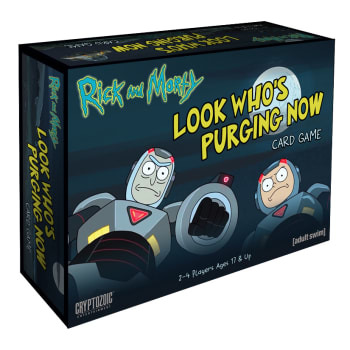 Based on the popular episode of the TV show, Rick and Morty: Look Who's Purging Now Card Game utilizes Cryptozoic's new Gryphon card-game engine to deliver gameplay that unfolds at lightning speed and is easy to learn. Simultaneous play: 2 to 4 players play their cards at the same time to rack up kills during the annual "Festival"! Simple, addictive gameplay that rewards both luck and strategy Weapon Cards are found items or Rick's inventions, leading to effects that can change the outcome! Play as Rick, Morty, and others with art from the unforgettable episode of the show.